As previously reported, the court accepted the case of Town of Greece v. Galloway in May of last year, a legal challenge that centers on the invocations that are offered at town hall meetings in Greece, New York, just outside of Rochester. The matter stems back to 2010, when local residents Susan Galloway and Linda Stephens sued the town, asserting that its preponderance of Christian prayers violate the Constitution. Represented by the American Civil Liberties Union (ACLU), the women noted that most of the invocations were in Jesus’ name or referenced the Holy Spirit. Galloway and Stephens contended that the prayers made them feel “marginalized” as they are not followers of the Christian faith. Galloway is Jewish and Stephens is an atheist. After some residents first complained to town officials about the matter, other faiths were incorporated into the meetings, including at one point, the Wiccan religion. However, as prayers continued to be in Jesus’ name more often than not since the town is largely comprised of Christian and Catholic churches, the women decided to take the matter to court. But the Supreme Court found otherwise on Monday, noting the nation’s history of government prayer. “The town of Greece does not violate the First Amendment by opening its meetings with prayer that comports with our tradition,” Justice Anthony Kennedy wrote on behalf of the majority. 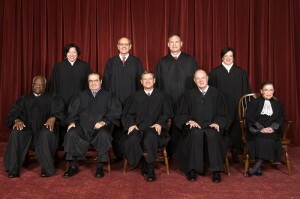 All of the justices that favored the prayers are of the Roman Catholic religion. One Catholic justice dissented, while the rest that opposed the prayers identify as Jewish. Kennedy, who was considered the swing vote, stated that prayers do not have to be generic and void of specificity. “To hold that invocations must be nonsectarian would force the legislatures that sponsor prayers and the courts that are asked to decide these cases to act as supervisors and censors of religious speech,” he wrote. However, he warned that prayers that are repeatedly evangelistic in nature or speak of eternal punishment for unbelievers could be problematic. “If the course and practice over time shows that the invocations denigrate nonbelievers or religious minorities, threaten damnation or preach conversion, many present may consider the prayer to fall short of the desire to elevate the purpose of the occasion and to unite lawmakers in their common effort,” Kennedy wrote. “Absent a pattern of prayers that over time denigrate, proselytize, or betray an impermissible government purpose, a challenge based solely on the content of a prayer will not likely establish a constitutional violation,” he stated.